I've been hoping for weather, really of any type. I noticed earlier in the week that maybe there might be some sort of storms going through the area today. When I went out this afternoon, I was pleasently suprised. A cold front touched several strong storms in the area. 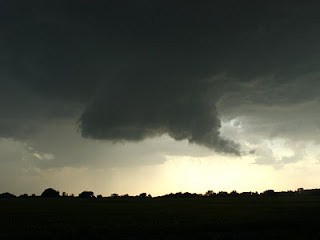 The area had strong updraft (note the rain curtains on both sides) and gobbled the small clouds that were forming below it in the humidity getting absorbed by the storm. Even though I really didn't see any of the funnels, it was nice to go on an early fall, second season run.